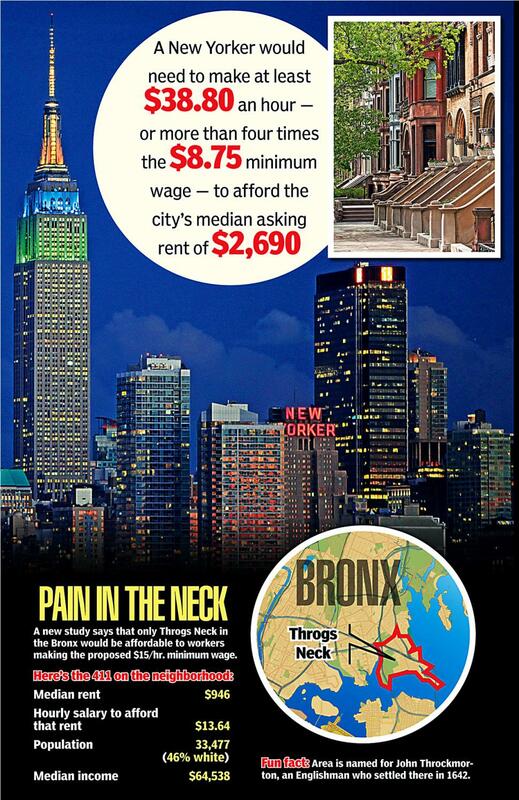 The NY Daily News reports a recent study by StreetEasy Research showing there is absolutely NO housing in NYC that a household with one minimum wage earner can afford. The Daily News reports "affordable" as 40% of income - although the federal government and NYC generally use 30% of income, and in earlier periods, 25% was considered "affordable." According to StreetEasy rent data, New Yorkers need to earn an hourly wage of at least $38.80 to afford the city’s median asking rent of $2,690 in 2015, more than four times greater than New York State’s current minimum wage. For those workers that currently earn the state’s minimum of $8.75 per hour, there are no neighborhoods in which median asking rent could be paid affordably. The extent to which rent growth has outpaced income growth in New York City means low-wage workers face three options: find several roommates to lower their personal rent burden, take on more than one job, or move out of New York City.